We went ice skating with friends yesterday. It was a lot of fun! At the very end P started skating on her own. The last 40 ft before the exit door she let go of Dave’s hands and started moving on her own towards me. I’m so excited and proud of her new skill but what I’m really proud of is her courage. P came off the ice after initially going around a couple times with Dave. First she said she wanted to go back to her friend’s house and then she said she wanted to play games. I told her we would eventually do both but at that moment we were there to skate and I really loved watching her out there. I asked her if she could go back out and give it another try. She said ok. I was surprised it didn’t take much convincing. She was out for a few more turns and then she came back off. She said it was too hard and that she fell down. I showed her a bracelet I wear. It says” fall seven times STAND up eight”. That was all it took. She wanted to go back out again and this time didn’t wait for Dave. I had to grab her back. It didn’t dawn on me until today that she had mustered up the courage to try it alone. 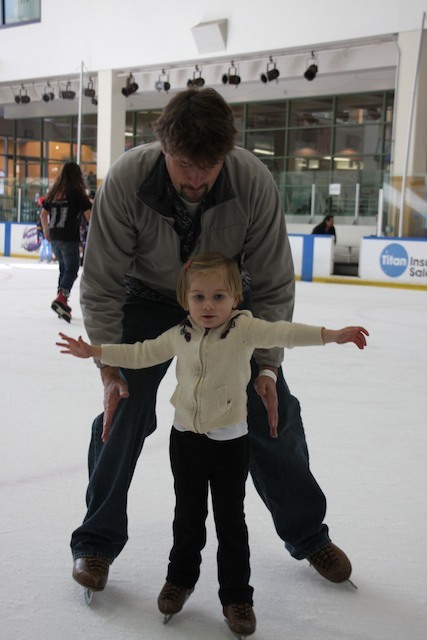 We should have given her the opportunity to do so.She went back out again and at the end when Dave was bringing her in she let go….and skated! She kept her balance! Clearly skiing helped build both her courage and balance. As I look back at all the things P has done and conquered I’m glad we’ve introduced her to so many sports. First at 8 months she conquered floating, then at 20 months she was able to swim, then tennis, soccer, bowling, skiing and ice skating. Every activity has boosted her confidence and therefore built up more courage for the next thing. I think that’s why it takes less convincing. Our pep talks are quicker. I’ve always asked her to show me some courage. I’ve told her I know she has it in her, I’ve seen it, and I and she need it right now. That whole string of thoughts has become like a trigger for her to believe in herself. It’s quite amazing. I’m so proud of her leaps of faith and ability to push her comfort zone out further. When she tells me she doesn’t like doing something because it’s “yucky, not easy or hard” I’ve tried to explain that you can’t learn anything new without being uncomfortable first. You have to feel yucky before you can feel comfortable. The words are making much more sense now. They are relating to past experiences and the whole thing is clicking. It’s been so interesting to see the thoughts run through her head and literally watch the fear come off her face and the courage come on!